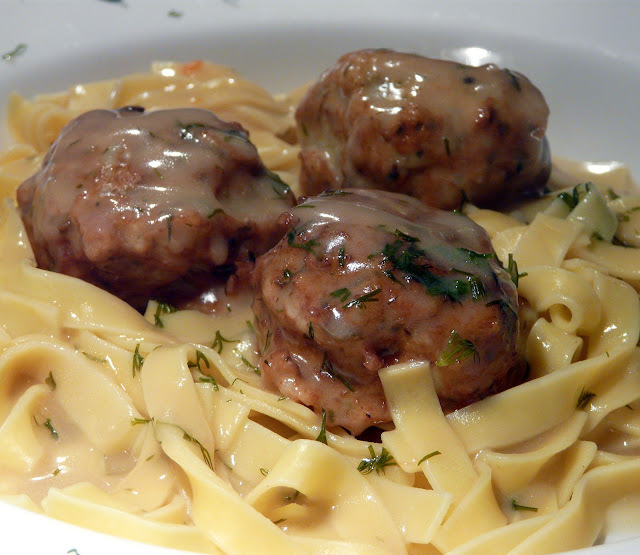 It has been a while since I made these meatballs. Usually I make them out of pork or a combination of pork and beef. But this time I used chicken. I hadn't planned anything for dinner so when I got home from work I pulled some boneless chicken breasts out of the freezer, did a quick microwave defrost and then ground them up in the food processor. Dinner came together quickly. While the meatballs browned I made a quick version of the Avgolemono Sauce (roux, chicken broth, fresh squeezed lemon juice). I added the meatballs to the sauce and simmered on low for about an hour. Because there were no eggs in this sauce there was no concern about the long simmer and curdling. The green comes from the fresh dill and minced spinach. These are extremely tender and flavourful meatballs. You can also use them to make Greek Cabbage rolls. paper towels and then add to a pot of chicken broth. Simmer for 40 minutes until tender. Remove meatballs from broth. Strain broth and reserve 1 1/2 cups. Return broth to stove and bring to a boil. thickens. Do not bring to a boil. Make a roux with butter and flour, add the chicken stock that you cooked the meatballs in, simmer, add some of the hot sauce to an egg yolk and then slowly stir the mixture back into the remaining sauce. Add lemon juice. Add the meatballs and simmer on low for a few minutes. Do not boil if using the egg yolk. NOTE: I cheat sometimes and make the sauce using just a roux. Add the chicken broth and add the juice of a lemon or two. This way I don't have to add the eggs. The meatballs can be browned and then simmered in this sauce without worrying that the sauce will curdle. I've never seen Giouvarlakia (meatballs and Avgolemono) served with pasta but you make a strong argument here to try it out...nice one! I don't believe I have ever tasted Avgolemono sauce. Mmmm...these look delicious. You can bet I will be tasting it! I do love avgolemono sauce. I remember being in a small roadside restaurant in the hora and almost everything on the menu was made with this lemony sauce. Why do I torture myself by visiting your lovely blog when I'm hungry? Hmmm, perhaps your blog makes me hungry? Yes, I'm SURE that's it! 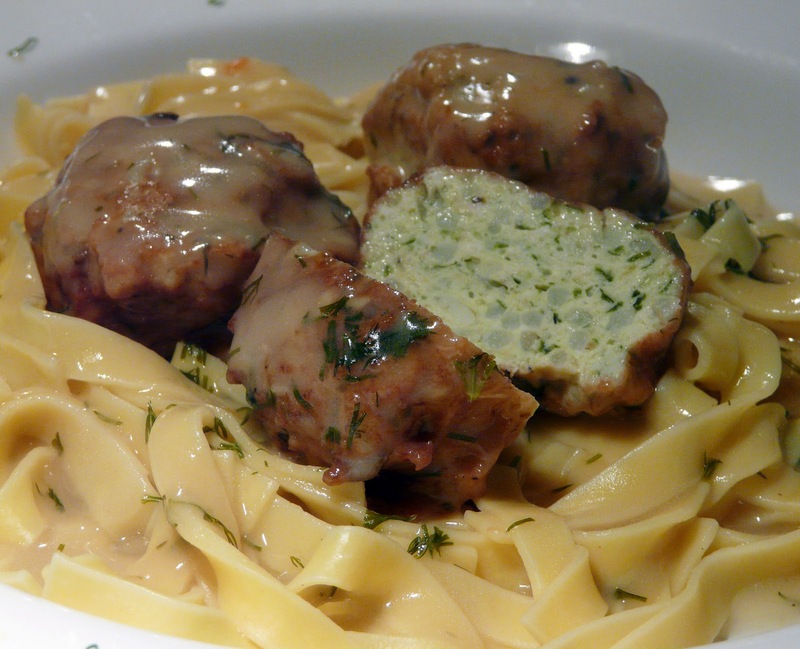 I'd love to try this variation of your recipe Ann ~ the chicken meatballs look tender, light and succulent. Count me in, I adore avgolemono sauce too ~ I must try it without eggs, have never done it that way before.